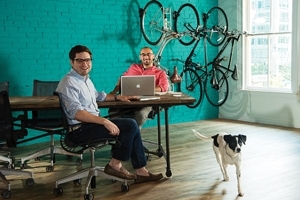 Geoff Silverstein, MBA '11, and Ross Nover, CAS/BS '05, in their startup design firm, Friendly Design Co. Anyone who's worked as a graphic designer has toyed with the idea of venturing out on his or her own. "We were crazy enough to do it," says Geoff Silverstein, MBA '11, who reconnected with high school buddy Ross Nover, CAS/BS '05 and adjunct professor, to form Friendly Design Co. The pair was adamant about their startup's direction. "We did not want to be glorified freelancers. We wanted a business," Nover says. Because their equipment and software was current, the only real initial investment was $1,000 to join Canvas, an open, shared working space in D.C. for creative types that the pair finds to be a congenial and inspiring situation. "We're growing organically," Silverstein explains. "We didn't want to open a big office with nothing to do or sink money where we didn't have to." With a background in entrepreneurship and management, thanks to his Kogod training, Silverstein also focused on the marketing aspect, which relies on social media and word of mouth. The majority of their clients are small businesses that seek them out for help on branding and positioning. "The work with startups is fascinating and rewarding," Nover says. "Doing this on the ground floor when everyone is still shaping ideas." The pair tries to keep to a "normal" schedule, to balance home and work life. "But we quickly learned that 5 p.m. is not the end of the day," Nover says. Feeling their way through this first year, Nover and Silverstein have refined their philosophy through experience. "We want to solve client problems," Silverstein says. "We put style out of the way—there is not one right way to do something. As a result, we come to solutions that others might not." This story was originally published in the August 2013 issue of American Magazine.